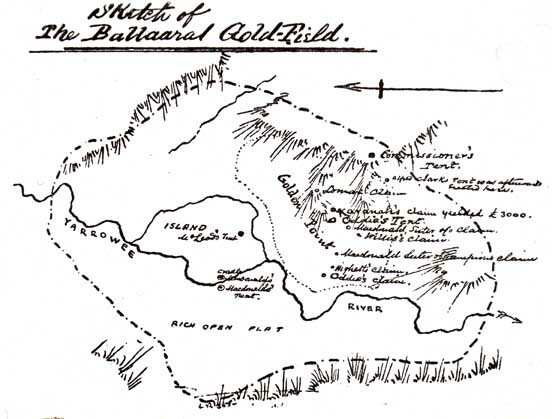 'Sketch of the Ballarat Goldfield, 1851, University of Ballarat Historical Collection. Sir, Perceiving that the name of the Diggings here is generally pronounced incorrectly I beg to state that it is a Native name and that the accent in not on the last syllable but on the one before the last as written above. It is a pity that Englishmen should spoil the Euphony of the Native Language. S.T. 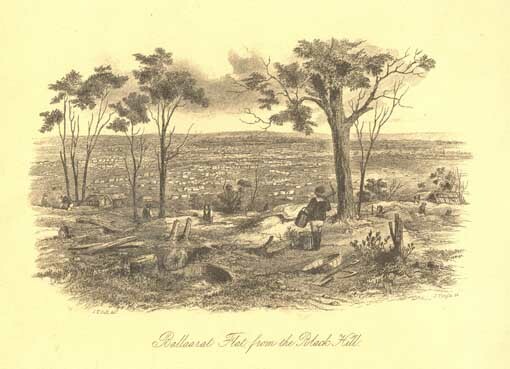 Gill, Ballaarat Post Office and Township from Government Enclosure, 1857, lithograph. Art Gallery of Ballarat Collection, purchased 1994. Municipal District 1855-1863, Borough 1863-1870, City 1870-ct A petition was gazetted early in September 1855 from ‘two hundred and ninety-two householders, resident in the township of Ballaarat [sic]’ requesting that the township might be proclaimed a Municipal District by the name of ‘The Municipality of Ballaarat [sic]’. 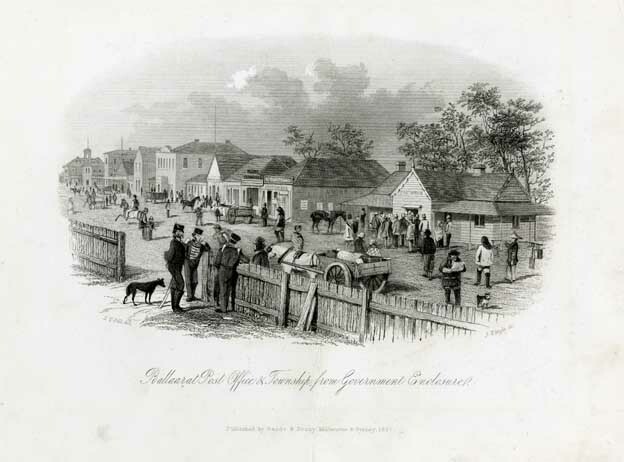 The Municipal District of Ballarat was proclaimed on 18 December 1855. It commenced ‘at the north-east angle of allotment 1 of section A, Parish of Ballaarat [sic], thence by a line bearing east one mile twenty-two chains and eight links to a marked post; thence by a line bearing south to the River Yarrowee; thence by the River Yarrowee to the southern boundary of the Township of Ballaarat [sic]; thence by the said southern boundary and a line bearing west one mile and ten chains to a marked post; thence by a line bearing north one mile four chains and forty links to the western boundary of the Police Paddock; thence by the western and northern boundary lines of the said Police Paddock to the north-west angle of allotment 2 of section C, in the Parish of Ballaarat [sic] aforesaid; and thence by a line bearing east, being the south side of a Government road, to the commencing point aforesaid.’ A meeting was held on Monday 14 January 1856, at 12 o’clock noon at ‘the Saloon of the Golden Fleece, Lydiard Street,’ to elect members to the Municipal Council. The following members were elected to the position of councillors: Messers James Oddie, Robert Muir, Dr. James Stewart, Messers William Tulloch, A.B. Ranken, J.S.Carver, and Patrick Bolger. The bye-laws of the Municipal Council of Ballaarat[sic] were gazetted on Monday 30 June 1856. The first rates for Ballaarat[sic] were struck in 1856. ↑ Geelong Advertiser, 28 Nov 1851. This page was last edited on 23 April 2017, at 06:08.